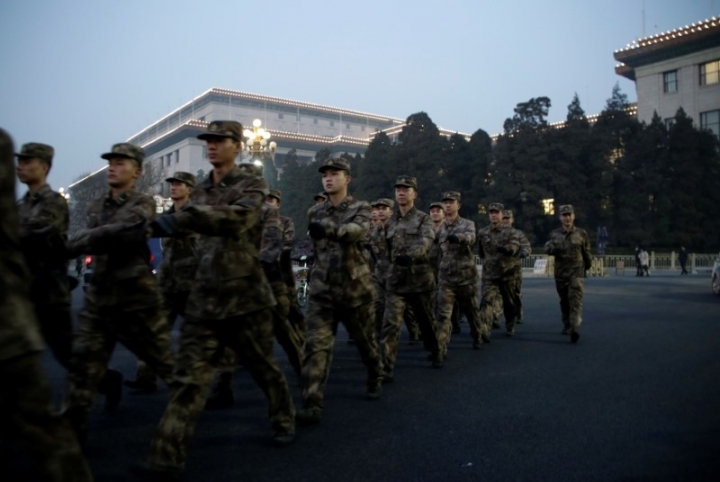 BEIJING (Reuters) - China's plans to reduce troop levels are on track, the Defence Ministry said on Thursday, after a 2015 announcement by President Xi Jinping that the People's Liberation Army would cut 300,000 troops, with most of the cuts due by the end of 2017. China, which hopes the measures will leave it more money to spend on high-tech weapons for its navy and air force, and result in a leaner and more strategic military, has struggled to resolve the grievances of those previously laid off, however. Ministry spokesman Wu Qian said there were "detailed arrangements" in place for the reductions and things were proceeding smoothly. "This year it will achieve its set aims on schedule," Wu told a regular monthly news briefing, without elaborating. In February, military veterans demonstrated in central Beijing for two days, demanding unpaid retirement benefits in a new wave of protests highlighting the difficulty of managing demobilized troops. Previous protests have been sparked by pension problems suffered by some demobilized soldiers who fought against Vietnam in 1979.